ABA Structures has engineered a 563 cubic meters thickener for the Bald Hill Lithium project. The photo shows the installation of the modules on site. 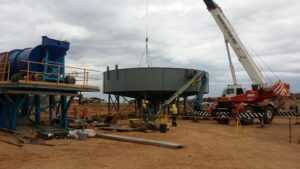 The thickener which has a diameter of 16m and a maximum height of 6.5m above ground is designed to sit on 20 steel-columns and a central post which transfers its weight and its content weight to the foundation. The thickener is equipped with a scraper system which is driven by an electric motor. This electric motor is mounted on a bridge on top of the thickener, which applies a maximum torque of 150,000 Nm on a drive shaft, driving the rake arms. The system is designed for the full capacity mineral in addition to the application of ultimate limit state wind and earthquake. Wind forces are calculated to the Australian standard AS1170.2 and earthquake effects are to AS 1170.4. Assessment of the thickener to the earthquake, considering sloshing forces and dynamic hoop stresses are done to API 650. ABA Structures analysed and assessed all structural components of the thickener, including its shell, base, radial beams, columns, the bridge and the scraper. All calculations, analyses and assessment results are recorded in a comprehensive calculation report which is submitted to the client.